IT staff continue to modernize classrooms on River Campus to facilitate technology use in classes and support a variety of teaching and learning styles. To meet increasing demand for larger classrooms with multimedia capabilities, two classrooms that were previously retrofitted were combined to create one modern, digital media classroom in Meliora Hall (pictured above). The new Meliora 221 is outfitted with a camera and screen capture software for recording lectures, a digital audio/video system, customizable lighting, and dual projection screens, all controlled by a single touch screen. 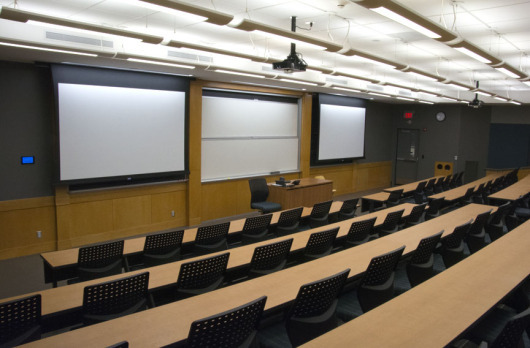 The room’s built-in lecture capture capabilities integrate with Blackboard, the University’s learning management system, enabling students to view lectures, notes, assignments, and other class materials all from the same platform. “As I’ve found my rhythm with all the technology, it has enhanced my teaching. In all, Meliora 221 is one of the best, if not the best classroom I’ve ever taught in,” Burgett said. Following the first semester of classes held in LeChase Hall, the new home of the Warner School of Education, classroom technology staff met with Warner School faculty to assess the effectiveness of the new classrooms. In response to faculty feedback, IT staff adjusted the technology setup in the Palladoro Methods Classroom to improve its usability. The touch screen control system was reprogrammed to streamline the user interface, making it easier to control how content is displayed on the classroom’s SMART board and five LED screens. Instructors now have quick access to the room’s computers, Blu-Ray player, lights, and audio from a single screen. When an instructor plugs a laptop in to the instructor station, the projector automatically turns on and displays that input. New shortcuts programmed into the control system allow instructors to complete common tasks — such as powering on all of the room’s displays and connecting them to the computers—with the touch of a single button. These changes make it easier for faculty to seamlessly integrate technology into their classes. A two-week project completed last summer has enabled more experiential learning in Gavett 244. KVM (“keyboard-video-mouse”) switches installed in the 50-seat computer lab allow students to switch between a Mac and a Windows environment at a single computer station. Specialized applications that run UNIX on Mac enable computer science students to learn programming hands-on.